Life in the jungle is getting even cozier than usual ! With a large number of volunteers now it means we have more time for enrichment and other projects. We also started new wall painting at the Almacén (the food storage room), which will be done in the upcoming weeks. Some early preparations have also been made for a few new construction projects, which we hope to be able to tell you more about in the not too distant future. In addition, we started the month with an enrichment competition between all the volunteers, divided into two teams. 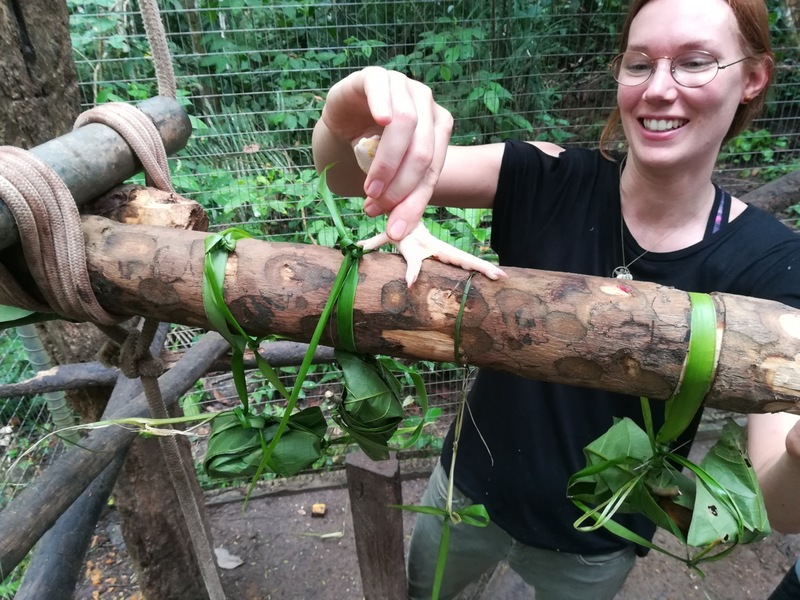 Team A made an enrichment game with peanuts for the Aviary cage and team B created a hanging playing obstacle with leaf food packages for Ruena, our tayra. Though it was a friendly competition, there can only be one winner. Our esteemed and objective judges, Olivia and Douwe, eventually gave team B the prize. The prize consisted of the most valuable product one can find at Esperanza Verde: chocolate sweets! 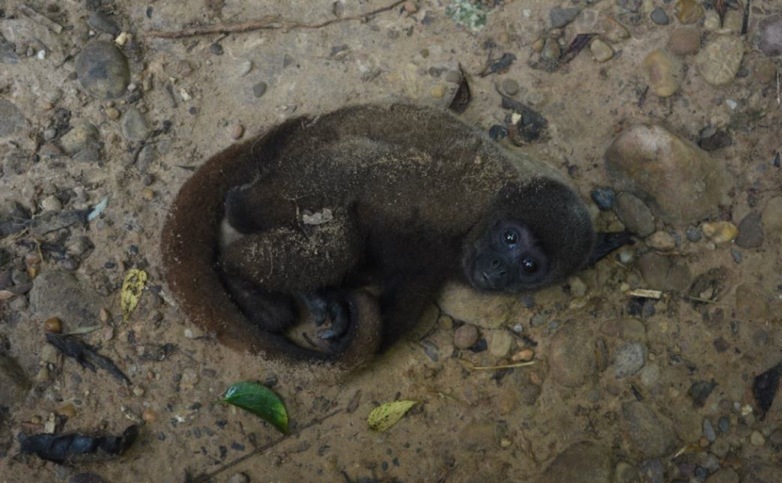 Tawaki, our male baby woolly monkey, is still being trained to sleep in the safety of the trees instead of on the ground. So far, he is making slow process. 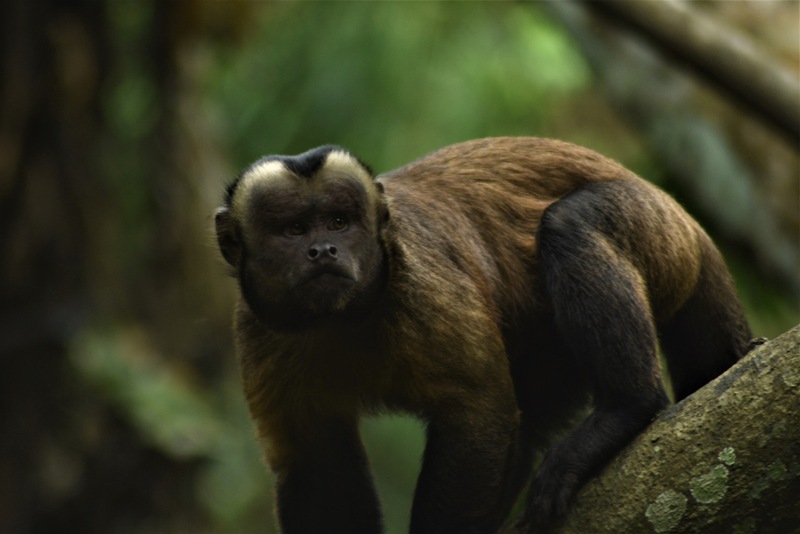 Mica, one of the adult female brown capuchins, received treatment for botflies (who lay eggs under the skin of different animals), however the larvae were already gone when we cleaned out the skin on her side. 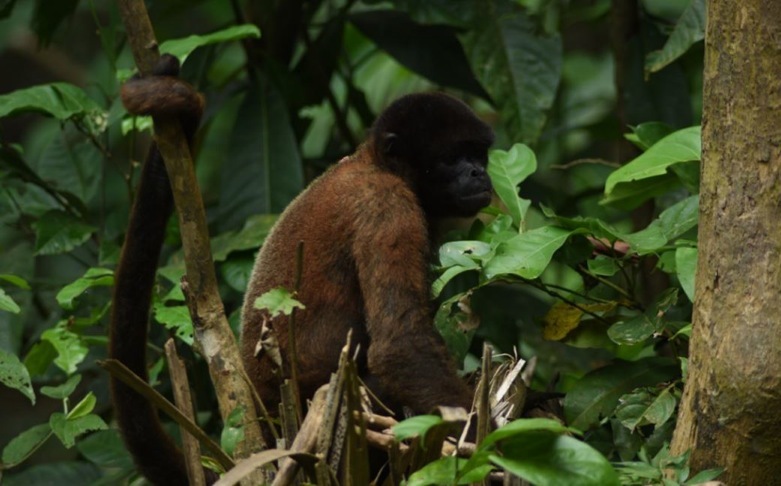 Samara, an older female woolly monkey was treated for P. Elegans, a species of parasites in the intestines which caused her to lose fur on her legs. 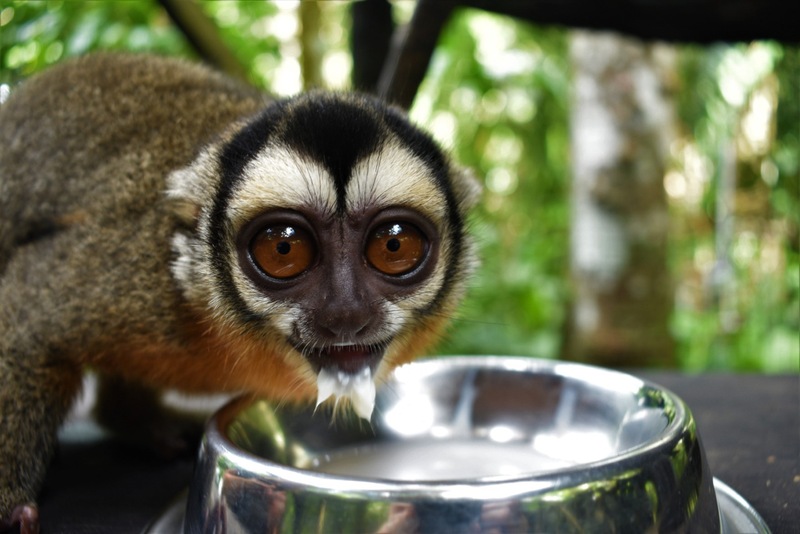 Luna and Otis, two Night Monkeys are still doing well in the outside Lucia cage. They are not big enough yet to be released, but we hope it wont be too long. Luna has not been gaining any weight over the past couple of weeks, so for now we have to keep a close eye on her. 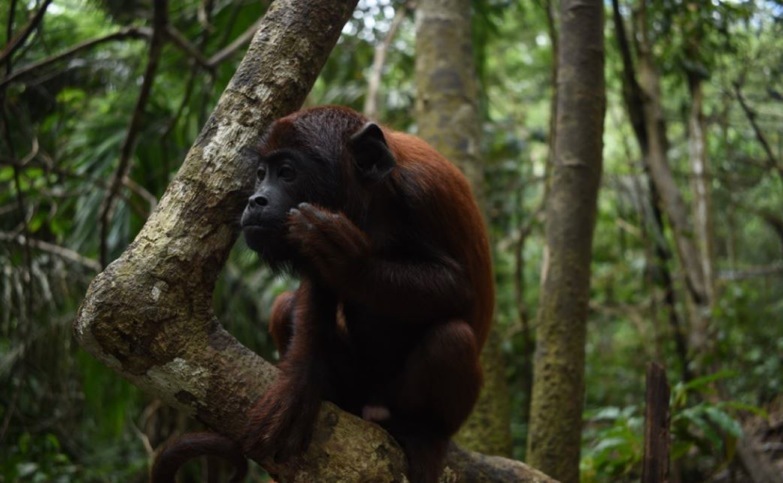 The howler monkeys, Darwin, Kaya and Caeser, have also been making small steps toward release. They are staying outside of their cage during lunch time and even during the night more and more. Caeser and Kaya especially are often unwilling to come down when we call them, which is the first sign of them becoming independent. 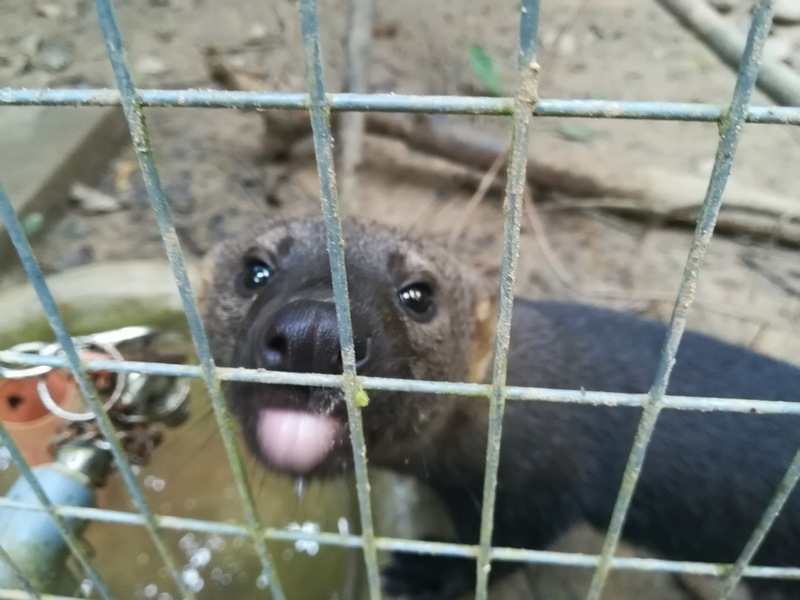 Douwe has started to do the first walks outside with Ruena, a Tayra. She is kept in an enclosure currently and desperately needs the enrichment! 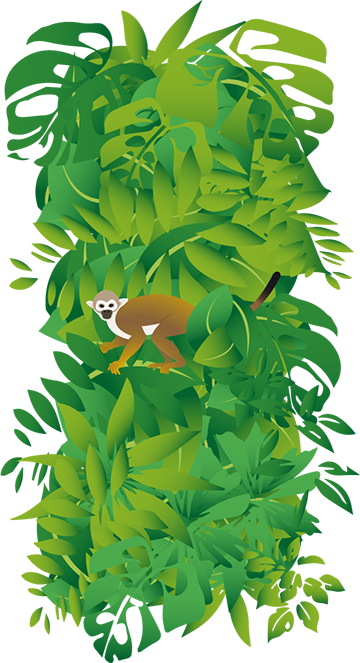 Tayra’s are a species that would normally maintain relatively large home ranges, with areas of up to 24km2 having been recorded. Her enthusiasm is definitely not contained by the fact that she is being walked on a leash. She is exploring her surroundings with lots of interest and excitement. Recently we had a sudden medical situation with one of the peccaries: Quintisha appeared to bleed from her nose and was breathing very heavily. We are not entirely sure what she is suffering from, as it is difficult to inspect her properly and we can only observe from the outside and often from a distance. We think she has some type of infection in her nose. She has been receiving antibiotics, first orally but later by injections with darts as she was not swallowing the oral medication. She is doing a little better, but is still under close observation. Ronya is still going on leaf walks with the volunteers every day, and she has started to climb a little. She is still quite nervous and very attached to the volunteers, but she does show more and more interest in the outside world. 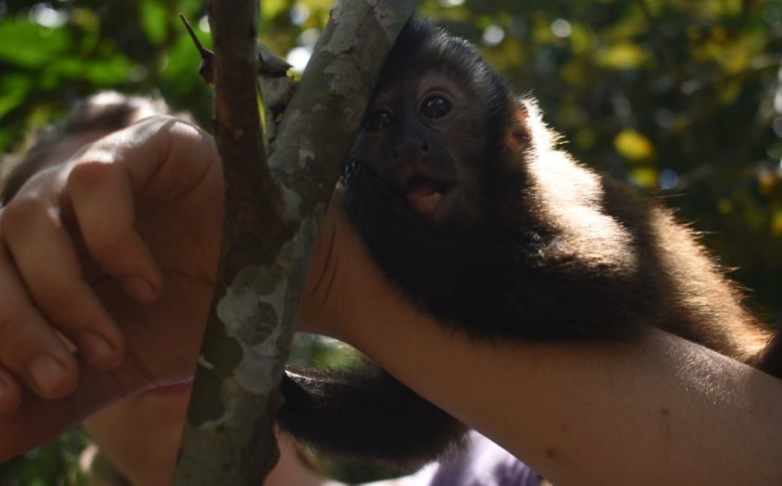 She is also learning to adjust to male volunteers, as it has often been difficult for male volunteers to hold her or even feed her. Slowly though, our guys have started to win her trust. Ermina, one of the macaws, has been bullied a lot by the other birds over the past couple of weeks, especially by the other two macaws, Ruiz and Mabu. At one point, we had to remove her from the Aviary cage and take her into one of the cages in the clinic. 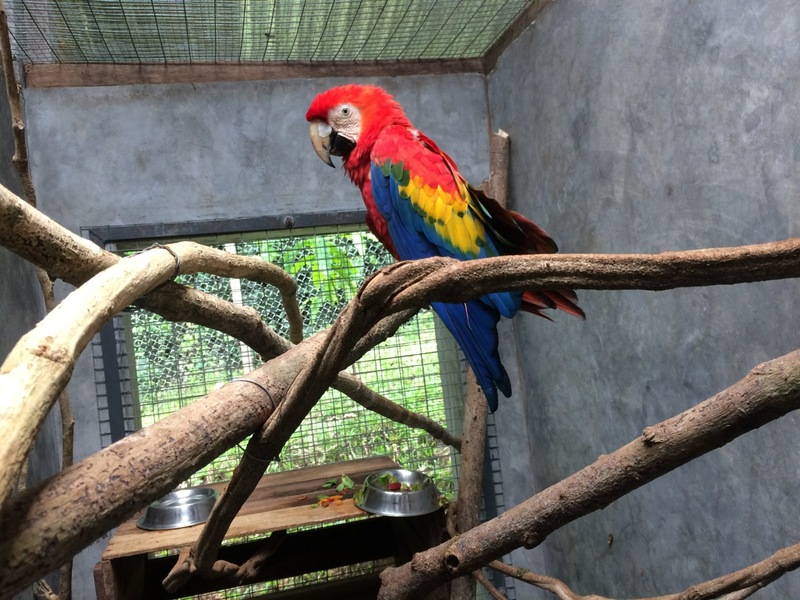 She had an impressive puncture wound on her beak, received by one of the macaws. The damage was repaired as well as possible and she received antibiotics. She is currently doing very well in the clinic, while regaining her strength and enjoying her own space and all of the extra attention. 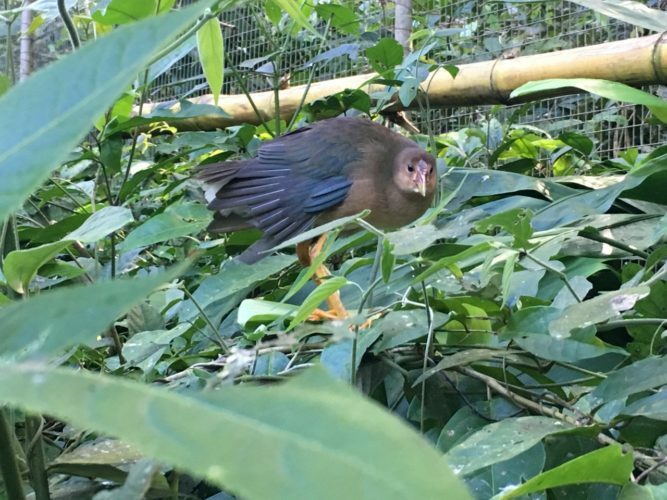 Koru, the purple gallinule bird which arrived in February, has been doing very well. So well in fact that he or she was introduced to the Aviary, the big bird cage. As far as we can tell, he has been having the time of his life, chasing down insects, hiding in the bushes and taking lots of baths in the pond. 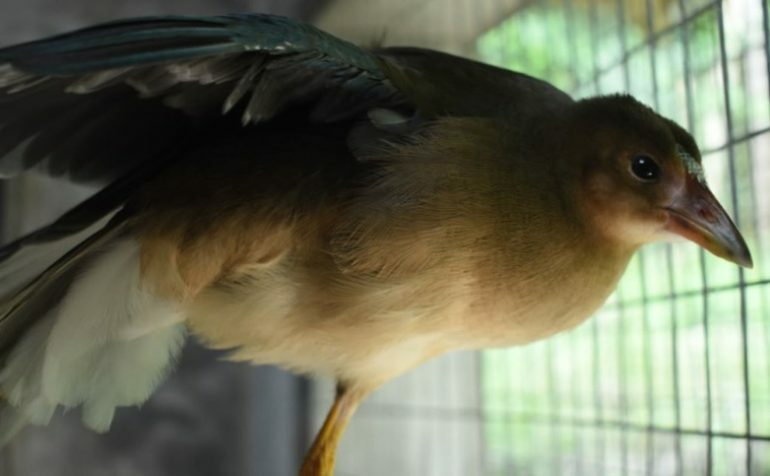 If he keeps doing great, he will stay in the Aviary permanently, as he would be too tame to survive in the outside world.